The Stakeholder's Chartbook: The 10-Year Note at a Record Low: Who Benefits, Who Loses. The 10-Year Note at a Record Low: Who Benefits, Who Loses. For the inaugural entry of this Blog, some additional background will be provided regarding the motivation behind its creation. Earlier this month I was reviewing market commentary I had written in 2010. The yield on the two-year U.S. note hit what at the time seemed an absurdly low 0.75%. Thanks to the Fed’s elixir of a second round of quantitative easing (QE2), that level now seems stratospheric. 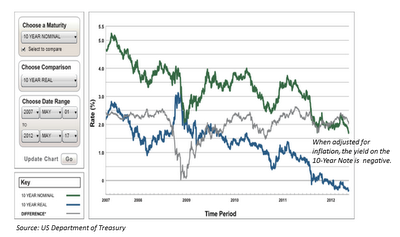 The Two-year's yield is now stapled to the floor hovering around 0.25%, anchored to the equally low Fed Funds rate. What’s more, just this week the yield on the benchmark 10-Year note reached a record low of 1.70%. Anyone who’s darkened the door of an introductory financial markets class knows the rule-of-thumb risk free rate hovers around 4%. A yield less than half the long-term average, and during a supposed economic recovery? While not yet in Japanese Government Bond territory (save that for another day), this entire interest rate environment should be raising many an eyebrow, and not just within the investment community. This brings us to the rationale behind this forum. When working as an analyst, I repeatedly came across data that struck me as highly relevant, not as an investor, but as a citizen with a stake in the economy. These findings were not limited to price signals from financial markets, but also included trends in macroeconomic data and developments in key policy initiatives emanating from Washington (and Brussels for you European readers). When discussing these issues with friends and family, I was often met with a lack of awareness or abject ambivalence. The goal of these pages is to put financial market and economic data into a perspective that the broad population rather than only investors can comprehend, especially with regard to the consequences of current market activity and the extraordinary measures being undertaken by policy makers. The current rally in safe assets, namely US Treasuries, provides an apt jumping-off point on this adventure. 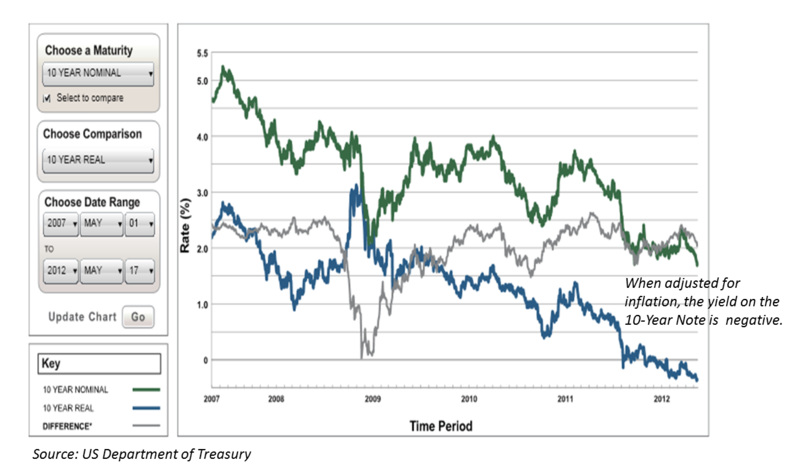 As seen in the accompanying chart, the yield in the 10-year has plummeted from nearly 5.5% in 2007 to the current 1.70%. The causes are well document, so no need to rehash them here. What is of consequence, however, is what impact these rates…and the policies that drove them down….are having throughout the economy, including the impact on investment income. Simply stated, when fairly valued by an unfettered market, the yield on the 10-Year note should not be this low. It is for one reason: the market is distorted. And the engineers behind this distortion (The Fed) don’t shy away from this fact. Since the initiation of QE (1 & 2), the Fed’s explicit goal has been to crowd out buyers of U.S. debt and force them farther out along the risk spectrum, into corporate debt and equities, thus providing corporations with the capital necessary to make investments in machinery, hire workers, send the economy upwards….yeah, you get the picture. But it has not quite turned out that way, has it (we’ll visit the employment situation in coming weeks)? If measured by those lofty goals, then many of the extraordinary Fed actions are a failure. But, if judged by perhaps more nefarious objectives, the government may be getting exactly what it wants. We should state that the Federal Reserve is independent and thus putatively apolitical. We must also recognize Chairman Bernanke is a gifted scholar who has an obsession with the root causes of the Great Depression and is willing to do anything to ensure those dark years are not repeated. But let’s also remember that, as with any marketplace, that of U.S. government debt consists of both buyers and sellers. The sellers are the guys down at the U.S. Treasury who are currently running a fiscal deficit of around 10% of GDP. For much of the past few years, the marginal buyer has been the Federal Reserve, ensuring there is adequate demand for this unprecedented debt supply. Granted recent demand has been stoked by yet another flare-up in the Eurozone debt crisis, as were previous rallies in 2011, along with a string of weakness in U.S. economic data; still the ability of the Fed to absorb so much issuance over the past few years remains a pivotal factor in low yields. But another component of the marketplace is the existing holders of government bonds. Many of these are pension funds and citizens with individual retirement accounts who hold onto U.S. government debt and high quality corporate bonds in order to collect the steady…..and up until recently….sufficiently respectable coupon payments associated with these instruments….hence the name fixed income. These investors cannot get pushed farther out along the risk spectrum….especially in such volatile markets….because these periodic payments are all they got. How would you feel to be 65 years old and having your nest egg churning out 1.70% for the foreseeable future? As seen in the chart above, when adjusted for inflation, real yields have turned negative, never a good development. The take-away here is that the Fed is acting as an enabler for the U.S. government to run massive fiscal deficits and finance these deficits on the cheap, while tossing the nation’s savers under the bus with laughingly low returns. And this, paradoxically, is in a period when the conventional wisdom is that Americans should be incented into saving more. Another irony is Washington’s villification of hedge funds and banks for levering up their balance sheets in the run up to the financial crisis, especially with ultra-cheap short-term financing. That’s exactly what the Federal Government is currently practicing. During this entire period the Treasury has taken full advantage of the meager cost of funding for short-term instruments by gearing new issuance towards them. As Italian and Spanish banks…not to mention Lehman Brothers… learned, it’s no given these short-term sources of funding will always be there. This all brings up the question no policy maker dare ask: what occurs should rates normalize? Most obviously, the financing costs on outstanding U.S. debt (spiraling towards 100% of GDP) would go through the roof, thus adding to the already bloated federal budget deficit. Such an increase in commitments could potentially lower the attractiveness of holding U.S. debt...including by foreign buyers (China alone holds $1.17 trillion in US government debt)….and the corresponding lack of demand would send yields even higher. In financial markets, we call this a death spiral. To combat such a scenerio, the government would need to make up the difference with new taxes or spending cuts. And we saw how palatable that is to the beltway with the dead on arrival Simpson-Bowles Commission Report. An alternative is... with a wink and a nod to a “strong dollar policy” ...the greenback is allowed to weaken thus inflating away our debt. This would really stick it to the foreign bond holders while at the same time importing inflation via U.S. dollar-denominated commodities, thus hitting consumers and industry in the pocketbook during a tenuous-at-best recovery. In the short-run, the most likely manifestation of such market distortions is capital, in search of yield, accumulating in supposedly attractive corners of the markets and potentially creating asset bubbles. Sounds familiar to the early-mid 2000s, no? It is not difficult to have some level of sympathy for Brazilian officials complaining of an influx of hot money into emerging markets, thus fueling inflation, equity and real estate bubbles in those regions.